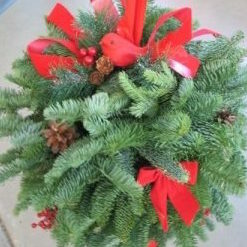 Learn how to make an Evergreen Kissing Ball. A great holiday or winter-long décor for your door front. Fee $40 plus tax. Includes Styrofoam ball, ribbon, wire, evergreen boughs and decorations for one kissing ball. You will be very proud with your creation!